How do you know if a deer has hemorrhagic disease? 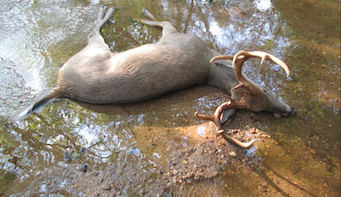 Telltale signs are dead deer found in or near water sources like streams and ponds. How do they get the disease? The virus is transmitted by a small biting midge, also known as no-see-ums, and there is no way to prevent or stop the spread during an outbreak. While the disease is not transmissible to humans, it can lead to other infections that could make the animal unsafe for consumption. What should hunters do if they kill an obviously sick deer? Hunters that kill an obviously sick deer should avoid consuming the meat. In areas that are being heavily impacted by the disease, hunters should consider reducing or eliminating doe harvest for that season to avoid over-harvest. To assist with monitoring the disease, please contact your local Game Management office if you encounter a sick deer or a dead deer found in or near water. More information about hemorrhagic disease and to see a complete list of symptoms.